Today, a wide range of freebies allows us to experiment with various options to keep pace with the latest achievements in web design. 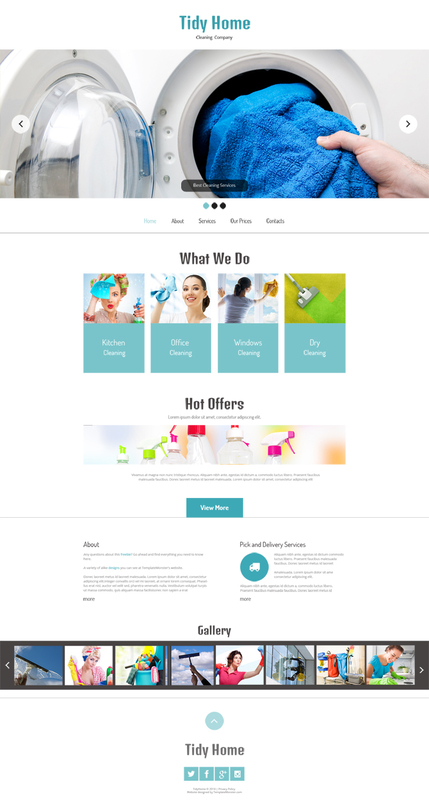 In this post, you are offered to check a free HTML5 theme for cleaning company and others that advertize their maintenance services on the web. Giving a try to this offering is definitely a move in the right direction, as it provides an opportunity to improve outcomes of your cleaning business without employing programmers and web designers. It means you’ll have a great chance to save on promoting your services online. Coded by true experts in their field, this template ensures easy customization that will let you adapt its features to your own preferences. One of the main elements making this theme stand out against the background of similar options is its simple and clean layout. You are unlikely to find a person who isn’t nuts on minimalism in web design nowadays, that’s why an uncluttered layout is definitely the best choice for creating a great online platform. It will add elements of sophistication to the appearance of your website and emphasize benefits of cleaning business. Bright pictures will help you avoid monotony on your site and encourage interest of more potential customers in your services. These visuals ideally harmonize with a large Slippry Slider on top of the homepage and an Elastislide Carousel gallery at its bottom. Your website visitors will not remain indifferent about alluring photographs of your company in the gallery while social icons will motivate them to visit profiles of your enterprise to keep abreast of its latest offerings. If you are looking for a template that boasts of an attractive visual aspect and ability to provide rich content, this is an indispensable option for you. Don’t hesitate to try it and experience all of its benefits for your cleaning company.